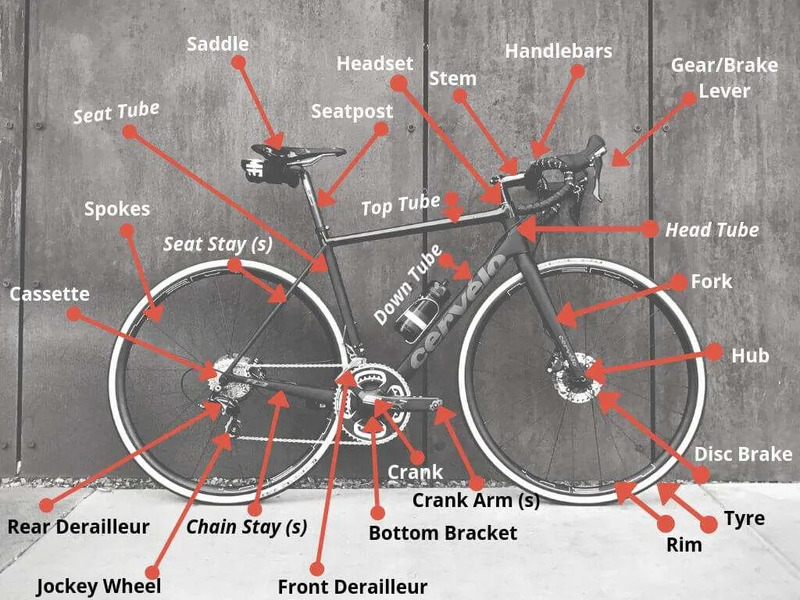 Bicycle anatomy can be both incredibly simple or frustratingly complicated. At a very basic level, a bicycle is two wheels with a frame, pedals and handlebars. Turn the pedals, the wheels go round and hey presto. Sometimes though, there is a need to go much deeper into the detail. For example, if you need to explain to a mechanic what is wrong with the bike, or if you need to describe the bike to the authorities should it, or parts from it, ever be stolen. If you’re not sure where the bottom bracket is, or what a derailleur is, then our handy bicycle anatomy guide for beginners is for you. It’s a very good idea when you buy a new or second-hand bike to keep a record of exactly what parts (and the make and model of each part) are on the bike and any unique characteristics (such as a two-inch scratch on the down tube – do take photos). Most online listings for new bikes have all the parts (including the all-important brand and type/model) conveniently listed. If you change/upgrade a part, do update your records and any online bike registration database records (such as with immobilise.com that the police have access to should a stolen bike be recovered). The front wheel attaches to this, which can include suspension or be rigid depending on the classification of your bike (road, mountain bike, hybrid). This connects the fork and the rest of the frame along with being the connecting point for the headset. This runs along the top of the frame. Rear brake cables usually run along the top tube or are integrated within it on some bikes. This is the bottom of the frame which connects to the head tube. Often this is the widest part of the frame. The bottom bracket is the bottom of the frame and is where parts of the drivetrain are connected. This vertical tube of the frame completes the ‘front’ triangle of the bike, connecting the top/down tube and bottom bracket. This extends to the rear of the bike from the bottom bracket. Running alongside the chain, which gives it its name, it forms part of the rear triangle. The final part of the frame, which extends from the seat tube to meet the chain stay at the point where the rear wheel connects to the frame. Depending on your bike’s classification these could be drops that you find on road bikes or flat handlebars you find on mountain bikes, they allow you to turn the fork which steers the bike. This slots into the seat tube of the frame and is where you attach your saddle. The seatpost can be quite long (depending on the cycling discipline) to give you the option of raising or lowering the saddle. A seat clamp (metal collar) keeps the seatpost securely in place and is secured to the frame by quick release or a bolt. You will find ‘dropper seatposts’ on certain mountain bikes (mainly for XC, Enduro) for automatic post height adjustment, via a control on the handlebars. Where you sit on the bike. There are a wide range of saddles available from heavily padded to sleeker, race-style versions. These attach to the handlebars and are often built into the brake levers, especially with modern road bikes. Pulling the lever will cause the bike to brake, and moving it laterally side to side will often cause a gear shift. Mountain bike shifters come in different types – twin-lever being the most common. Twist (‘grip shift’) and electronically controlled shifters are other types. This is attached to the bottom bracket and consists of the gears at the front of the bike. These come in several forms including double, triple, compact or single. These are attached to the chainset and are the ‘arms’ to which the pedals are attached. In the simplest form, pedals can either be flat or clip-in (the shoe is attached to the pedal when engaged). The chain wraps around the chainset and the gears at the rear and is turned by your pedalling, propelling the bike forward. Less common, but not a new concept, bikes can also be ‘belt-driven’. These belt drives can be found on urban bikes – you will notice that they don’t have derailleurs. This will only feature if you have a double or triple chainset as it moves the chain up and down the rings using the cables attached to the gear levers. These are the gear cogs at the back of the bike which the chain wraps around; they are referred to as the cassette or rear cassette. They come in a variety of ratios depending on your cycling discipline. The rear derailleur works the same way as the front derailleur in that it uses cables connected to the gear lever to move the chain up and down through the cogs whilst you’re moving. On both derailleurs there are screws which can be tightened/loosened to make gear changes more efficient – a process referred to as ‘indexing’. Some bikes don’t have gears, so don’t have derailleurs and only have one speed (single speed). However, there can also be internal gears in the rear hub (usually three gears), which gives the appearance of a single speed bike (so no derailleur). These are the minor cogs that the chain runs around underneath the derailleur/cassette which allow it to keep moving smoothly on its return to the chainset. These are the thin metal rods which make up the centre of the wheel, providing strength and structure to it. This is the method of removing the wheels of most modern bicycles and includes loosening a lever which allows the wheel to be removed without the use of tools. The centre of the wheel, this contains bearings that allow the wheel to turn smoothly. If you ever hear grinding on the bike whilst moving, this could be the cause. This is a feature on road bikes that allows the handlebars to be situated further forwards than the top of the head tube – these can be obtained in several measurements depending on your size. The headset provides the smooth connecting interface (bearings) between the head tube and front fork (fork steerer tube) that allows the fork to rotate and you to steer the bike. Spacers – these often allow you to raise the height of the handlebars slightly. They are metal rings that can be added to the top of the head tube under the stem – several of them can be stacked to raise your bars for a more comfortable riding position. Disc brakes – these can be cable/mechanical or hydraulic. Rim brakes – caliper brakes (common on road bikes), v-brakes (common on cheaper or older mountain bikes) and cantilever brakes (a classic brake, still used on some cyclocross bikes). Whilst not so common (more focused towards trial mountain bikes and some road bikes), hydraulic rim brakes exist. Also, less common again, drum brakes. These are attached to the brakes and are pushed against the surface of the wheel rims (or disc rotor) when the levers are pulled, causing the bike to stop. These refer to disc brakes, the rotor being the actual disc that is hydraulically (or mechanically – cable operated) stopped when the levers are pulled on disc brakes. Mountain bikes fall into two main categories, hardtail or full suspension. Full suspension bikes have a rear shock/suspension to add comfort and control when going downhill and over obstacles/jumps. Looking for further detail? The following two videos cover mountain and road bikes.